Maurus Valentine Bell entered the world on February 27th, 2016. 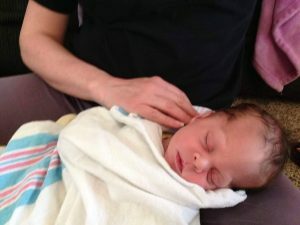 Born at 39 weeks, It was a quick labor and delivery with no complications. My husband and I were very anxious and excited to meet the newest addition to our family. 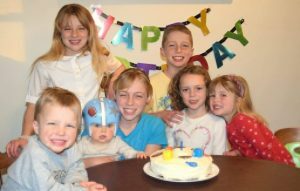 Having 6 older children ranging from 11 years old down to 2 years old, we had left the name and even the gender a surprise. 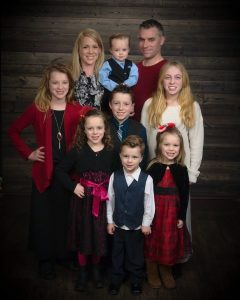 As soon as Maurus was born, we were excited to see we were adding a baby boy to the clan of 4 girls and 2 boys at home. As the doctor laid him on my chest, I let out a sigh of relief and tears of joy. It was the best feeling ever. At first glance, Maurus appeared very healthy and perfect. Weighing 8 and a half pounds, he was my biggest baby yet. As my husband began to take photos, he looked concerned and whispered to me, “what about his little head ? It looks like something might be wrong”….I immediately asked, “what are you talking about? I had only been snuggling him against my chest and had not seen anything wrong just yet. Right then, the nurse took Maurus from me to check his vitals and she said, “Oh, you know how babies look funny when they are first born…. he is fine”. But I saw the look on my husbands face, and the looks of the dr and nurses and knew something was wrong. I insisted to hold him again as soon as they finished checking him over. As soon as I did, I could see exactly what the concern was about. Maurus had a ridge running down his forehead, and from a birdseye view, his forehead was shaped like a triangle. He had very deep pinching dents in the side of his head/near the temples. My heart sank. I immediately started to cry. What was wrong? Was his brain ok? Did I cause this somehow during my pregnancy? Even though I knew the answer was no, and this wasn’t my fault, millions of thoughts were running through my head as a cried and held him tightly. It was a devastating feeling and my husband was also very upset and took the news so hard. So many emotions and so fast. Labor, delivery, excitement and then fear, all at once. Soon after, the pediatrician on call at the hospital came in. She checked him over very quietly and then said, “everything will be ok”. I asked her, “How do you know? And what exactly is this?” She then explained that Maurus was born with a rare condition called craniosynostosis. Occurring once in about every 2,500–3,000 births. 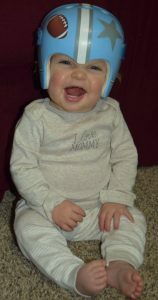 The type Maurus had was a more rare type called Metopic craniosynostosis with trigonocephaly. She explained that the skull is made up of sutures and that the metopic suture in the forehead had fused too soon, before birth. 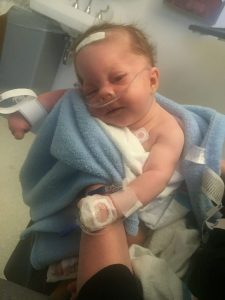 She had not actually seen a baby yet with this type of craniosynostosis, but knew of craniosynostosis because about 30 years ago, her own little brother was born with this condition. She said her baby brother had to have a invasive surgery (CVR) because that was the only option back then. She went on to tell us that her brother is now a very successful doctor, and you’d never know he had this surgery. She explained there are 4 main types of craniosynostosis and that Maurus appeared to be a non syndrome, single suture metopic and trigonocephaly case. There is no known cause for non syndrome craniosynostosis. She said she recommended we consult with a neurosurgeon and plastic surgeon as soon as possible and see about setting up the endoscopic surgery and helmets therapy following that. Endoscopic option has only been around for about the last 10 years she said. We were relieved a little to have an idea now of what was going on, but still so worried. We had not even left the hospital yet, and my husband was already searching on his iPhone for more information. We left the hospital the next day with our referral to Cincinnati Children’s hospital. As soon as we made it home, I immediately began calling to get the appointment set up Cincinnati Children’s. They called us back and quickly set up a catscan and appointment. For the next week and a half I googled and read whatever I could about craniosynostosis. Since we had not heard of it until now, I wasn’t sure if I should google the condition or not, but I had to know everything I could about it. I wanted to ask the right questions, to prepare and understand. It was hard, and I felt anxious and worried and even a little depressed at times. 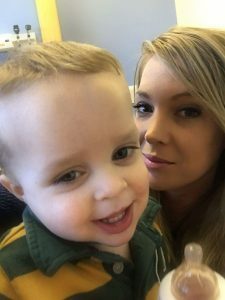 I wondered if my son would be ok and thinking of putting him through surgery made me incredibly sad. I did my best to pray alot and be positive. Our older children were in love with their baby brother, but were also very worried about his little head too. They began praying for him every single day. Even asking their friends to pray too. Maurus was also baptized and we had many people from our church praying for him. The day of the consultation came, and things started off with a catscan and then meeting with Dr. Stevenson and Dr. Pan (our neurosurgeon and plastic surgeon). 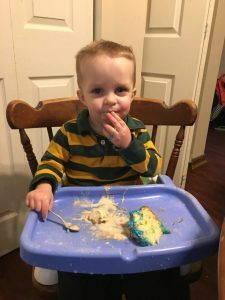 They both agreed that Maurus was a severe case and confirmed that it was indeed metopic craniosynostosis and needed surgery. They explained that the metopic suture was more then 75 percent fused already and that because he was severe that the more invasive procedure might be best to consider. They said Maurus would have to wait until he was 8 months or so for this procedure. The cranial open vault surgery would require one or two blood transfusions. The skull would be opened from ear to ear, and they would reshape and remold bones around the eyes and forehead. I was very concerned with this option though. Because Maurus was a severe case, what if pressure began to develop while we waited? 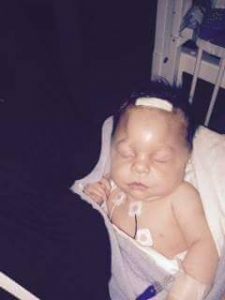 What if he began to have seizures and vision loss or developmental delays. I had the gut feeling to just go ahead with endoscopic surgery to open that suture back up as soon as possible. They told us to go home and think about our options. I asked more questions, researched and read what I could. At the end of the day, I knew that even if cosmetically my son didn’t look perfect, that I was more concerned about his brain. Many things I began to read and research pointed out that earliest intervention is always a good thing. I even found a retired neurosurgeon to ask his opinion. 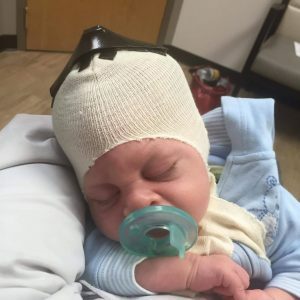 He admitted that no matter what surgery is done, with craniosynostosis there can always be a chance for more surgery later, no matter which option is used. 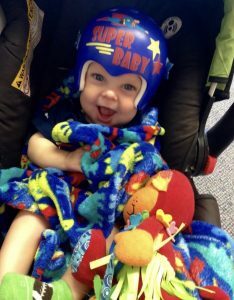 Earliest intervention would help achieve the most normal head-shape and prevent any chances of developmental delays, pressure or complications with the brain. He explained that because endoscopic surgery is still fairly new, that some surgeons may not be as familiar with it yet, because they have not had as much experience with endoscopic option. Also the metopic suture can also be more difficult to fix sometimes compared to the other sutures. So after weighing the pros and cons of the two surgeries, we decided to still go with our gut, and give endoscopic surgery the chance while it was still an option. Endoscopic is only an option up to six months old, and preferred even by some surgeons to be done no later then 4 months. It can vary with surgeons, and which suture is involved. After 6 months the bones in the skull harden and are not pliable, endoscopic is then not much of a option. I knew for peace of mind that having the suture opened as soon as possible would be best. We thought we should start small, rather then possibly needing the large invasive surgery repeated later in life. After our decision was made, we signed papers and began the process to set it all up. Lab work, physical etc needed to be done on Maurus and we wanted to donate blood for surgery to have on hand. The surgeons had said the chance would be less then 10 percent that Maurus would need blood with this less invasive approach. We however wanted to donate just in case, so we also got that in order. My husband donated his blood to have on hand for the big day. About a week before the surgery, we were sent to Hanger Clinic where we would meet our Orthotist, Aaron Drury. Aaron was very helpful and explained everything. Maurus had to have a few photos taken, and a 3D scan done to begin making his first helmet that he would wear following surgery. All the details were now set, and we began to count down the days to Surgery. It was nearly impossible to sleep or be calm especially the night before surgery, but on April 8th, we took our sweet 5 week old baby in to hand over to the surgeons. We just wanted to hold him and not let go, but we knew it was best and necessary for our child. So with some fear, and tears we said goodbye and watched them roll our baby down to surgery. We would spend the next few hours praying non stop while we were given little updates and nervously waiting. Finally, we were called to speak with the surgeons as Maurus was being taken into recovery. They said everything went great and they did end up needing a little of the blood my husband had donated. They explained what to expect once we saw Maurus, and we thanked them for their work. Soon after, we were able to go see Maurus in the recovery room. He had just woken up and was crying so hard and obviously very scared while in the arms of one of the nurses. As The nurse placed him in my arms, I started to talk to him. He immediately knew it was me, and started to calm down. They quickly set us up in our own room and I was able to start nursing him again. This helped so much to help comfort Maurus, and also to calm my own nerves. He was also so hungry from hours of fasting before surgery. It was hard to see his head swollen and bandaged. I.V.’s sticking in and monitors and cords all over him. We spent a day and a half in the hospital and everything went very well. The nurses and staff were great at helping keep the pain under control and were there for anything we needed. We then went home and within a few days we went back to Hanger Clinic to get the first helmet fitted. Over the next several days Maurus worked up to wearing the helmet full time. We started with a hour here and there and then a few hours until he was able to build up to tolerate 23 Hours a day, every day. Sleeping in it and everything. Maurus had some slight swelling the first few days after surgery so it made me nervous at first to take the helmet off and on. His two inch incision was a little sad to look at and puffy. Once the swelling went down there was a large “soft spot” that was basically created when the bone was removed. Where the suture was “re opened”. Once the helmet was able to stay on 23 hours a day, it became so much easier. Maurus adjusted so quickly and slept in it like a champ. Within the month of his surgery, I found “Cranio Care Bears” on Facebook. They insisted on sending us a care package for Maurus and prayers for his recovery. It meant a lot to us. They are a fantastic organization. They send helpful items for surgery/recovery and many prayers. 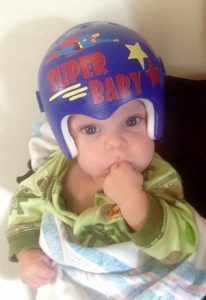 I then also found another amazing craniosynostosis group called “Cranio Kids- Craniosynostosis support”. They have been a great group for support as well. Everyone is there to help each other with questions, concerns and share their experience. 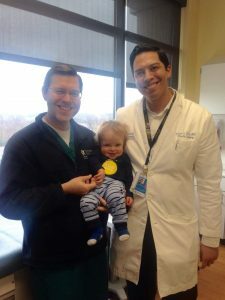 We had a couple follow ups with the surgeons as the next few months went on, and we had many appointments with our orthotist Aaron. There was even an ophthalmologist appointment also to be sure all was well with the optical nerves and no pressure present. Maurus passed the tests with flying colors. No issues whatsoever. With all our appointments, both our surgeons, and Orthotist always were very helpful and addressed any and every question or concern. 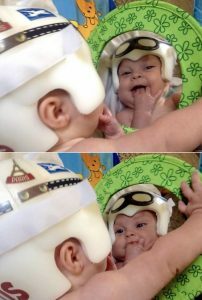 Making sure the helmet was fitting Maurus just right and adjusting it as Maurus grew. Once it was too small then a new scan would be done to have a new helmet made. The helmet helped to protect his head where the bone had been removed, and helped to remold and shape a nice rounded forehead for him. I realized quickly that my fear I had of what others would say or think, meant nothing to me. 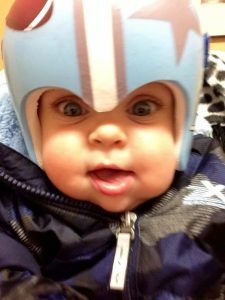 Maurus was adorable in his helmet and we made sure to decorate every helmet with a different theme. Everywhere we went, Maurus received a lot of positive and happy attention. He brought alot of smiles to every strangers face we passed by. A few silly comments here and there, but, overall, everyone thought it was so cute. 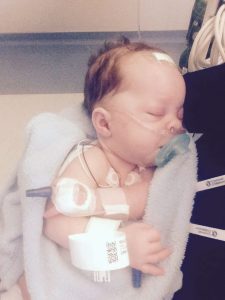 They were also curious and would then make conversation with us, and that would give us the opportunity to help explain his condition and spread awareness for craniosynostosis. We continued helmet therapy for almost a year. Maurus went through 5 helmets by the time of his first birthday. We then had another follow up with his surgeons. They were so happy and surprised by the amazing results Maurus had. 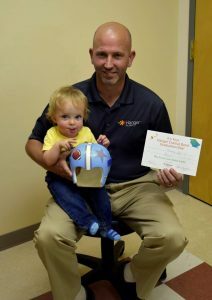 At our next orthotist appointment, we were able to graduate from the helmet. It was the best feeling ever. 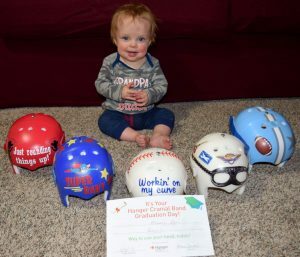 Another craniosynostosis group, called cappskids.org shared our video I made after helmet graduation. “Meet Maurus” can be seen on their website, https://www.cappskids.org/videos/ and Hanger Clinic made a little slideshow to share on their Facebook page as well. https://m.facebook.com/story.php?story_fbid=10155346537640731&id=110492140730 So instead of wondering why this happened to us any longer, we just want to use our experience to help others. 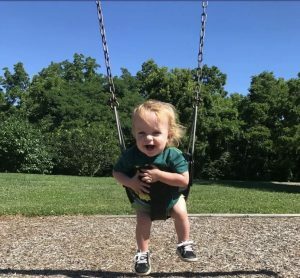 We want other parents to know, there is much hope! Especially since our son was such a severe case, and still able to achieve these results with the less invasive endoscopic approach. We just recently celebrated his 2nd birthday. 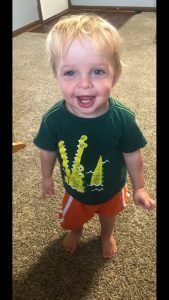 And we are about to celebrate his 2nd “cranioversary” as well on April 8th. The surgeons are still very pleased. They have actually told us that they do not expect Maurus to ever need another surgery, which is amazing news! They will continue to monitor and watch his growth over the next couple years, but are quite confident that all will continue to be great. 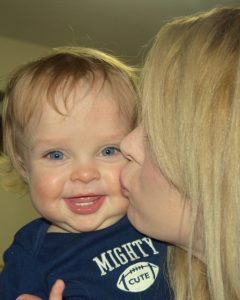 We know all the prayers helped us to find the right surgery choice and care for our son. He looks great, and you would never guess by looking at him that he ever needed surgery. He also has no developmental delays at all. We want to thank Dr’s Pan and Stevenson from Cincinnati Children’s Hospital, and Aaron Drury from Hanger Clinic in New Albany Indiana. 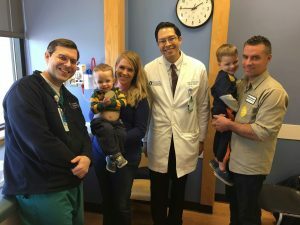 We are so grateful for the amazing work of both our surgeons and our Orthotist. We couldn’t of done this without them. We are so thankful for their skills, knowledge, support and dedication to helping our son! We are so blessed and so very thankful.